North/South (1984) was commissioned by Thomas Driscoll, who at the time at least ran the strawberry company which bears his family’s name. The work has something to do with what he told Annie and me about how his granddad, or maybe his great-granddad, got the company to be a big hit by planting strawberries at three latitudes in California (or maybe one of them is in Mexico or Oregon, I forget) and was thus able to supply the hotels in Chicago with fresh strawberries all year round, thanks to the railway. On one side of the painting the colors are meant to head south and be on the lush side, on the other there is a slightly hazy temperate sky color. A line that runs from the lower left to the upper right, not directly, is mirrored on the other side but it’s hard to see in a photograph. I think it obvious that I was concerned to have the work sit on the floor through its color and shapes and directions rather than just literally, and correspondingly that I tried to make the top be very airy—to float up or hover above, or to be gray or black and thus a depth but also a weight that bears down on what’s below—which I think also makes the top continuous with the back in a way the bottom part isn’t, or at least not so straightforwardly. It was in my mind that maybe one would remember the top and bottom of one side when looking at the other. The blue-gray is divided but otherwise even, but one has just seen how on the other side the top is airy but the bottom very different. Or one could see the blue-gray first, etc. My screens are important for the reason noted, which would also apply to any other work that comes right down to the floor. At that point one is for once in a world where the bottom of the painting is not hanging or suspended but standing. All that I have ever thought about the abstract and the literal is as it were tested at such a juncture. Color is active and can dissolve the surface without in that losing the opportunity to be a support, therefore to be perceptively more of a support than the literal support on which it is painted, and in my work it is. This is where one may see an aspect of what I mean by expressing the wish to make complexity visible. Painting by being what it is brings together in contradiction what seems to be the case with what one knows to be the case, and it is best when getting that thought out in a way that allows both to be equal demands on one’s attention. Also, it’s a screen so above it (it’s taller than a person but not much) there isn’t wall but space. It meets emptiness at the top and stands on the floor, using both but is neither fully independent of nor completely dependent upon either, but rather somewhere in between. 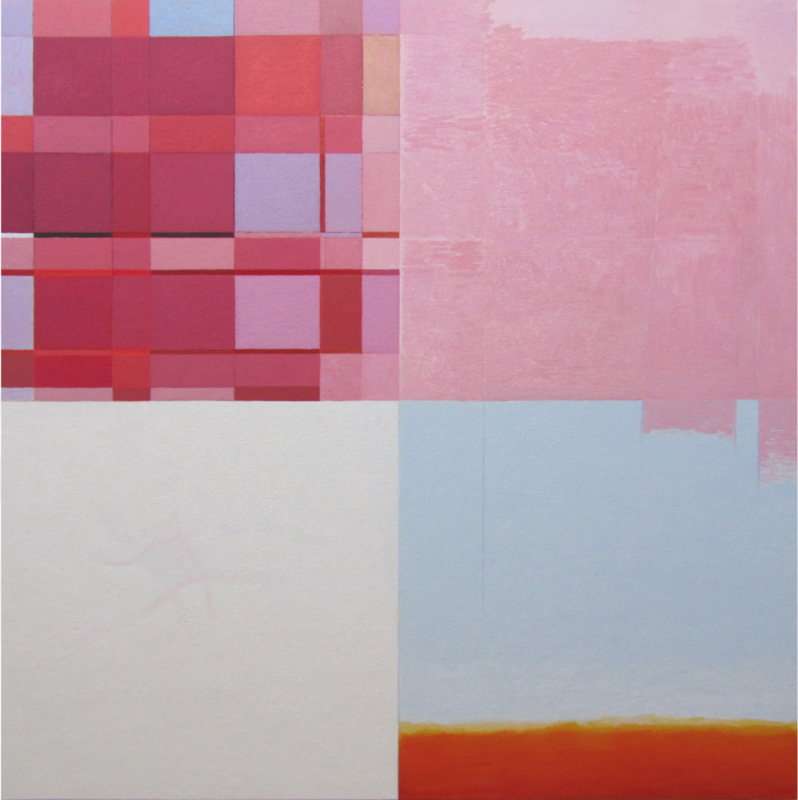 In a recent work, Painting that Began in the Sky (2013,) I think the idea of red at the bottom activating atmosphere returned, perhaps, in a way that reminds me of how one might remember, when looking at the gray side of North/South, how all the red on the other side is at the bottom.